This post is part of Portraits of Place. Slightly over a hundred years ago Biddeford, Maine was the place to be. Thousands of people worked in the mills during the day and lit up Main Street at night. The Biddeford mills were the first in the United States to mass produce any product – but it was the history, the many stories lived by the people in the 1800s and 1900s, that captured my imagination. I once thought the mills were old buildings that had no past, no present, no future. Then I took a tour and saw the North Dam Mill firsthand, and I realized what beauty and stories were held within those brick structures. What stood out to me the most were the hardwood floors. They were old and worn down, but beautifully placed throughout the mill, and the wooden landscape seemed to stretch on forever. Each piece of wood was its own map and had its own unique character. Every board had a pattern worn into it, which made them fascinating to look at. My careful footsteps disturbed mounds of flock still settled on the floor. The fluff whooshed around my feet, reminding me of all the people who once packed in the mills, swirling through their busy days. The cracks and dents, overly worn areas and gouges, retold the stories lived by those individuals who worked in this place. These scarred and scuffed pathways were traveled on for years and years and miles and miles and the routes are embedded in the floor of the mill. I thought about how the interior of the building almost looks preserved for a specific reason; how someday there will be other lives passing through, leaving their traces criss-crossed in the boards. Being in a building where so much history took place was amazing. I hope that one day the routes that I take throughout my life will be significant to another person in some way, either by how they approach certain situations or how they view the lives around them. 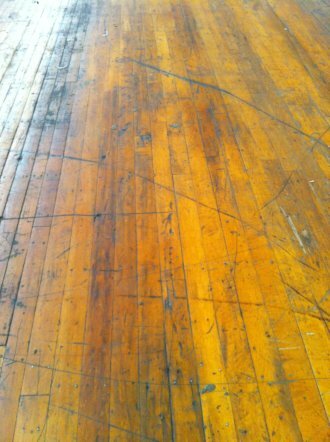 Looking back, I realize that I am part of the story told by the grooves and creases; that I added my own marks to the floors of the North Dam Mill that day. Post and photo by Brooke Boucher. This post is one in a series written by seniors from Biddeford High School for Portraits of Place. Three years ago, English Teacher Carolyn Gosselin began collaborating with the Heart of Biddeford, a nonprofit organization dedicated to the renewal of Biddeford’s Main Street area. Since then, youth voices have become influential in community planning, as students discover the proud history of this evolving mill town and share their perspectives on its renaissance. This was a great article. The imagery was amazing. I did not know that the mills had so much history. The imagery definately was great in this peice. I found it particularly interesting that there was still flock on the floors. Must’ve been a great experience! Really good article. It was very discriptive and gave me some insight on the potential the the building has. This article is amazing. It’s so cool to see that one place can have so much meaning and have an impact on people in such a big way. So I love this article! the way you look at the scuffs as a story is facinating. and the fluff on the floor I can only imagine! Well written and great picture to help tell the tale. This piece was very descriptive, and urges me to go check it out. I don’t really know much about the mills, but it sounds like they have a lot of history, just from the way the floors are worn. I think that you captured how much history that mills had. People may not know how much the mill has changed over the years. The picture is beautiful. A great way to capture a reader is with a picture with meaning behind it. I also love how you mentioned the floors were maps, and how the workers were there so long ago. Great job Brooke! I really enjoyed this article. I liked how it related the scars and imperfections of the floor to life in the mills hundreds of years ago. The article was full of imagery and remarkable descriptions of what was seen at the Noth Dam Mill. I can’t wait to go! Brooke amazing article. It had a great taste of style to it. Really showed how much history is really behind the mills and main street. I really am excited to tour the North Damn Mills and learn about all the history behind it first-hand. I like how you used imagery to describe the history of the Mills. You really showed the reader how a simple scuff mark has a story behind it of the tough experiences the citizens of Biddeford had to work through. Im surpirised how well the build is looking. I think that it should be used again. And the article was well written and i got a great insight of what the mill is like on the inside. This article was really great. I did not know that the mills had this much history. I also love the picture because the floor is just so worn down and old. Before reading this article I have never realized how important the mill was to biddeford. I always thought it was some run down building that nobody cared about. But after reading it I now know how important it was to this town and people. I really liked your article, you did a good job with it and I didnt know how much the mills mean to a lot of people. Before I read this to me the mills were just there, but now I know a little more about them.